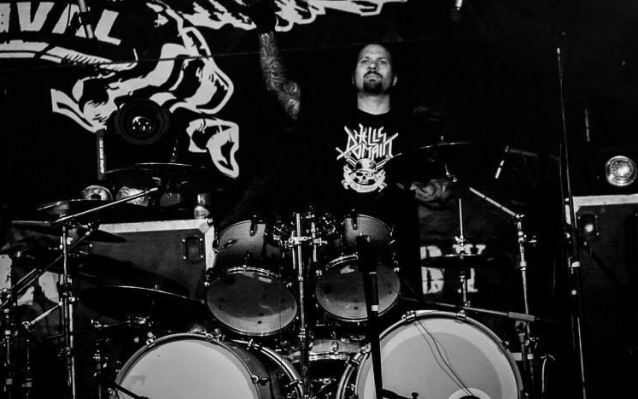 On October 5, drummer Thomas Jensen announced his departure from Danish extreme metallers ILLDISPOSED. Says the band: "Thomas has been beating the drums for us for more than 10 years, but somehow lost his motivation to go on. "We wish Thomas all the best for the future." Comments Thomas: "I want to thank the band for 12 great years. And I want to express my gratitude to all the nice people and bands I've met along the way. "I wish ILLDISPOSED all the best for their future." A replacement drummer will be announced soon. ILLDISPOSED's "Eyes Popping Out" video can be seen below. The clip was directed by MNEMIC guitarist Mircea Gabriel Eftemie. "Eyes Popping Out" comes off ILLDISPOSED's latest album, "Sense The Darkness", which entered the official chart in Denmark at position No. 78. Released on September 21, 2012 via Massacre Records, the CD was recorded at Antfarm Studio in Aabyhøj, Denmark with producer Tue Madsen (MOONSPELL, DARK TRANQUILLITY, GOREFEST, SICK OF IT ALL). The artwork was created by Mircea Gabriel Eftemie.